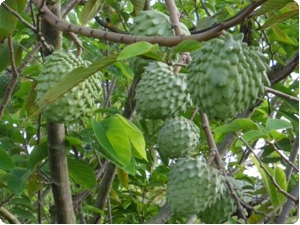 ATEMOYA (Annona Squamosa x A. Cherimola). Principle Producers: Tropical America, Southeast Asia and the Philippines. 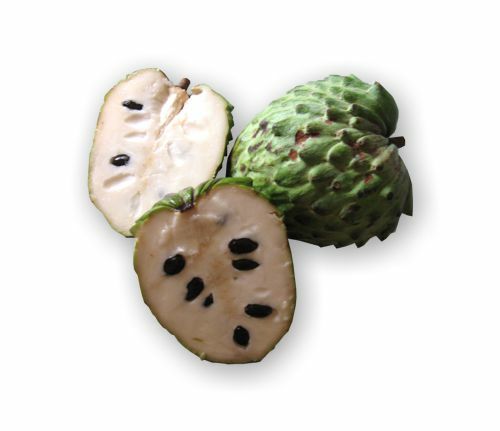 The Atemoya, is a hybrid of two fruits – the sugar apple (Annona squamosa) and the cherimoya (Annona cherimola) – both of which are native to tropical America. The first crossing of the hybrid was made in 1908 by PJ Wester, a horticulturist at the USDA Subtropical Laboratory in Miami. In Israel, it is called “Anon” (אנונה) in Cuba the fruit is called “mammon”, and in Venezuela “chirimorinon”. In Lebanon, the fruit is known as “Achta” and is used in many Lebanese desserts, including ice cream. Atemoya is usually heart-shaped or rounded and of a pale green colour, its bumpy skin is very susceptible to damage during processing. It is very juicy and soft, with white flesh, tasting slightly sweet. When ripe the fruit can be scooped from the shell and eaten. The Atemoya, like other Annonaceae, has flowers that are protogynous hermaphrodites, yet self-pollination is scarce. Therefore artificial pollination by hand almost always guarantees higher quality fruit. One variety: Geffner, occurs without the need for manual pollination. Deformed and underdeveloped Atemoyas on one side are often the result of poor pollination. The atemoya tree is medium sized, reaching 2-3.5 metres and responds well to pruning. The leaves are green and hairy when young, smooth when mature; they are elliptic, ovate or lanceolate in shape, however the leaves are often variable in shape on the same tree and can be about 20 cm long and up to 8-10 cm wide. Trees are semi-deciduous, however, the rate of leaf drop depends upon the severity of cold winter temperatures and pressure from leaf disease which is aggravated in late summer and autumn rains. Atemoya adapts well to most soils with good drainage but they do not tolerate continuously wet or flooded soils. Atemoyas should be planted at least 6 to 7.5 metres from adjacent trees and structures. Trees planted too close to other trees or structures may not grow normally or produce much fruit due to too much shade. The flowers emerge in mid-to-late spring on trees flush with new vegetative growth. The flowers are produced singly or in clusters of 2 to 4 leaf axils on one year old shoots, buds or new growth. The flowers are composed of 3 green coloured fleshy petals, 3 small and unobtrusive sepals, and numerous unicarpellate (single ovary) pistils on a common receptacle. Fruit: The fruit is conical to heart-shaped of about 7.6 to 12.7 cm. in diameter, and weighing 220 to 800 grams. The fruit surface may be smooth, bumpy, or have pronounced protuberances. As it matures, the fruit changes from green to yellowish green, the area between the bumps expands and becomes yellowish, and the fruit takes on a white or light blue-colour. The pulp is white or yellowish white with a cream-like consistency and a sweet and pleasant flavour. There can be 10 to 40 small shiny, dark brown seeds per fruit. Varieties: There are numerous varieties of atemoya, however, few have been critically evaluated over a prolonged period of time. The best variety in the climate and conditions of Florida for example, has been "Gefner 'which does not require hand pollination and produces good quality fruit. The production of' Page 'is good, but the fruit tends to split on the tree during ripening. 'African Pride' (' Kaller ') and 'Bradley' usually produce few fruit without being pollinated manually and African Pride fruit may develop internal disorders during ripening. Other varieties such as 'Bernitski "," Cuevas "," Chirimoriñon A', 'Chirimoriñon B', y 'Chirimoriñon C', 'Hette', 'Isla Gem', 'Lindstrom', 'Kabri', 'Malali', ' Malamud ',' Mammoth '(' Pink Mammoth '),' sacerdotal 'y' Stermer "have not proven viable for commercial production. The selection of superior varieties in the future is likely due to the many plants that are being studied in public and private institutions. 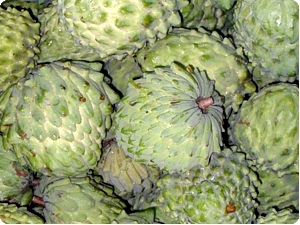 According to reports, apparently the optimum growth conditions for the production of atemoya seems to be at a temperature between 22-32 ° C, with a minimum of 70% relative humidity (RH) during flowering and fruit set, without limiting soil moisture from flowering to harvest and a long dry period for several months before the spring bloom. Propagation: Atemoya grafted onto seedling atemoya rootstock produces a vigorous, fast growing tree that starts producing fruit in 2 to 4 years. However mature trees on this rootstock are virile and it can be difficult to control their size. 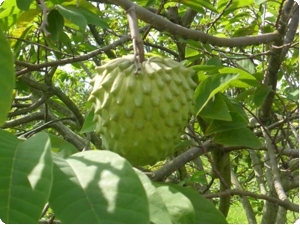 By contrast atemoya grafted onto sugar apple seedling rootstock tends to be somewhat less vigorous and can take a year or two to reach the level of production of atemoya grafted onto atemoya but it is generally easier to control in size. Production (crop yields): Yield from atemoya cultivation varies from year to year and is influenced by climate, the presence or absence of natural pollinators, pressure from diseases and insects, and cultural practices. Atemoya yields can range from 75 to 200 fruit corresponding to some 16 to 68 kg per tree.